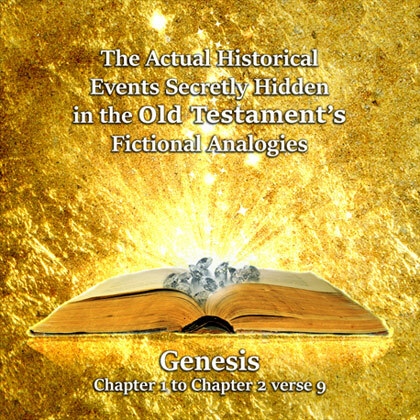 The Old Testament was not written for spiritual purposes, it was written in a unique way using code words to secretly hide actual events and scientific facts within fictional analogies. Our series of instant download recordings explains the numerous events and facts secretly hidden in the Bible. The Old Testament was written using fictional analogies to unite a divided group of Hebrews in “captivity” and convince them a “Lord God” was on their side in a futile attempt to incite the men to “re-conquer” Mesopotamia just like their Chaldean Shepherd King ancestors. Our recordings use ancient ben Panther family records and their private collection of the world renowned 100,000 volumes of “Enochian Literature” to explain actual historical events and ancient scientific facts. Ancient information about how the first “7 days of creation” actually refers to the first 7 levels of heaven that are created in a universe. Ancient scientific knowledge on how the One God expands to create the 4 in 1 God of creation “Yahweh”, with a Mother God and a Father God, whose son and daughter, live in the first universe of a creation. Details about how the free will choices associated with the 7th Day of creation actually took millions of years to complete before life in 3rd level physical bodies could begin on planet earth. Hear ancient facts about how certain humanoid chimpanzees in 3rd level temporary physical bodies became our ancestors when they received 4th level “Eternal Souls” and “Permanent Emotional Bodies”. Ancient scientific wisdom describes how human males and human females use different methods to process sensory information. Hear ancient documents describe the 9 levels of heaven and 3 levels of hell that exist in our universe. Ancient and modern ways that help you tell the difference between the Old Testament’s 6th level “Lord God Lords” and “Lord God satans”. Details on how at the birth of your temporary physical body you received the Soul of your permanent Emotional Body. A special power prayer is included with each recording so you may cleanse your ancestor’s memories, recorded in your DNA*, of the hatred and torture your ancestors endured due to the Old Testament’s fictional analogies. *As recently proven by science, our ancestors’ memories are recorded in our DNA, just like our ancestors’ physical body characteristics are recorded in our DNA. Scientific facts and ancient wisdom on how humans, as well as trees, cats, rocks and everything were made in the image of God. Historical information about the first race of humans who lived upon earth as well as what the concept of Adam and Eve actually represents. Ancient knowledge that woman was created to be the equal of man and that Eve did not eat an apple that caused the fall of the human race. Hear how you are an Angel in a permanent 4th level Emotional Body who is simultaneously living in a temporary 3rd level physical body. Learn about the “good” and “evil” paths in life, and why only the “good” can go beyond the duality of 6th level Lord Gods. Ancient wisdom on the Suns of God who live in heaven’s 10th, 11th and 12th levels and the Lord Gods who live on heaven’s 6th level. Ancient facts: The Garden of Eden’s “talking serpent” is a Lord God Lord and the “Lord God” yelling at Adam and Eve is a Lord God satan. Why cattle are respected in India and why bulls were worshiped by ancient Middle Eastern people. Learn how the Garden of Eden’s “gold that was good” refers to the ancient Egyptian alchemists’ gold made with Love Energies. Hear the ancient facts about the “speaking stones” and “seer stones” used by spiritual adepts throughout history. How the Garden of Eden’s flaming swords prevent those without Love Energized Merkabas of Bliss from entering the 5th level of heaven. The fictional analogy of Cain killing Able uses code words to explain the destruction of the Martian atmosphere. Actual ancient historical and scientific facts fully explain what caused “Lucifer and 1/3 of the Angels to fall from heaven”.